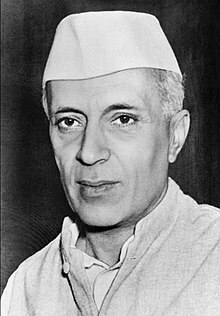 Jawaharlal Nehru (/ˈneɪruː, ˈnɛruː/; Hindustani: [ˈdʒəʋaːɦərˈlaːl ˈneːɦru] ( listen); 14 November 1889 – 27 Mey 1964) wis the first Prime Meenister o Indie an a central figur in Indian politics for much o the 20t century. ↑ "Nehru". Random House Webster's Unabridged Dictionary. This page wis last eeditit on 13 September 2015, at 17:35.